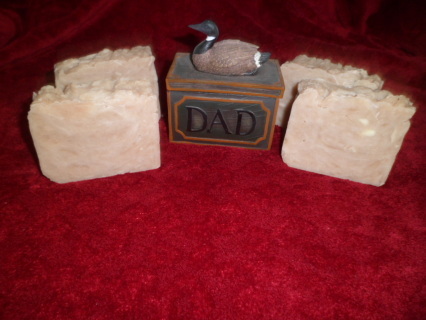 This is our Hot Processed Soaps Page. Hot Process is taking cold process soap and heating it up so that the soap saponifies and in the end result you get a rustic look and soap that takes less Time to cure. Our Hot Process soaps are mainly Essential Oil Soaps , though there maybe a few expections here and there. Our Hot Processed Soaps are Hand Cut so therefore may vary in weight. A favorite smell among men and boys. Our cedarwood and tea tree soap has a woodsy smell that is sure to delight your favorite guy. Great for the guy that likes to hunt and wants to smell like the woods around him, and this essential oil mixture is also great for killing bugs and keeping them off. Also safe to use on pets to kill fleas.